Children will sue ACS,DCFS,DHS,ADES,CYI,CYS,DCF,DYFS,DCPP,as parent to grandparent,when it is known of such inequities,for which arise premise on CPS willful,continual malice,misconduct. Such lawyers are rare,who contact regularly Bellas SUE CPS BY DEADLINE pro-se(self file by deadline) and W.O.N. Powerhouse... ext. 260/102. We appreciate the ongoing support from EVERYONE....This page is for the one who was the driving-force behind the nation first verified,pro-se self file clinic of its kind....Catering to those "forgotten"
and those who,at the time as her 2 girls,were and the realization that"YOUR child is able to sue pro-se in foster care for wrongful removal/continual removal,as lawyers agree nationwide with Bellas,and or when release from such brutal-clutches of CPS.1-855-806-0007.However when lawyer has not filed your suit,commence such lawsuit extensive preparation' get started pro-se,or lose such right,per violation,you the Innocent Good parent./grandparent is attempting to hold cps accountable for,as such lawsuit(s)have deadlines... ext. 102. UNITED STATES DISTRICT-FEDERAL COURT is now doing what is right. Kids are suppose to be enjoying the nice weather without a fret of such danger by a state caseworker/gov't agency C.P.S. Yet a state agency DYFS,CPS,DCF,DCPP,ADES,CHFS,DHS, DCFS,has already set the seeds,to implant-along with others hence, planning to keep YOUR child away,for one's own objective even though no abuse,serious injuries,exist at time of "cps involvement..."
No reasonable jury shall disagree when your reviewing the actual harm/facts/caseworker supervisor culpability ergo is clear. Inspiration for all worldwide whose currently suing wisely DCFS,DCPP. Driving off after dropping your UN-ABUSED child off for a weekend routine visit...Never to "normally"see the child again for YEARS....(all premise on withheld evidence/lieing as high as to the appeal court in order to continue removal from a loving parent home... . IMAGINE: Your sitting in a family state (superior courthouse)hearing,"child was fine. 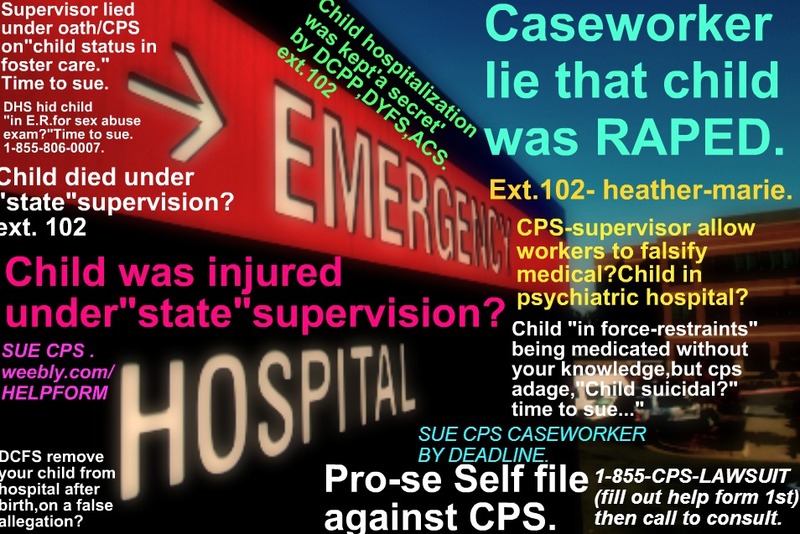 "SAME DAY of court your child is in a hospital yet worker(s)cps and prosecutorial(D.A.G.) ALL knew,YOUR child was able to return home(when CPS agency already documented a child of yours,is able to return/can't be return,"no legal basis..." NO LEGAL AUTHORITY..." or report cite,"No Substantiated"abuse. The fact a caseworker"supervisor"knew?But yet "stayed in the background"acting as if"child was fine/was thriving/but yet proof is clear... Caseworker knew... Supervisor surely knew,and yet all still went on for YEARS pretending child was"better"in CPS"care." JUST IMAGINE....Then arm yourself with fact(s)legal knowledge,self-taught,if not taught by your "lawyer" or a hired lawyer,and sue. or ext. 102.heather-marie(if calling during hours of 10:30 a.m.eastern standard until 5:30 p.m)thank you.fill out help form first. Hours of Operation are :10:30 a.m.-eastern-standard time until closing 8:30 p.m. Monday Through Friday...Weekends till 4 P.M.EST. FROM THE EVILS IN LIFE TO A CHILD WHO WAS DOING WELL IN SCHOOL/HEALTHY/THRIVING. Bella called upon lawyers(at time of initial file)to sue...NONE DID. Did not sway a UNIQUE-extreme astute woman like her one bit. turned her down repeatedly to sue child protection services;however did not phase her one bit. She file pro-se...not just"any filing..."she ensure it was done properly,professionally and TIMELY. Staff as always thank you Mainstream-Media for following her family warranted civil rights injury lawsuit and airing it again just a few months ago airing her story of her daughters/and such loving innocent godo parent $50 million dollar suit against not one but 12+caseworkers,one former D.A.G. (acting in the role of prosecutor)when he himself knew as well such truth,and even at 1 time inform CPS HOTLINE,to preclude from taking calls,and or the local office,but yet was later proven all the calls were truth,of the child(both girls)being at significant/repeated risk. JOYCE SMITH who at the time,"knew"child was at staid risk,facing daily risk,horrific act(s)including but not limited to child was actually"missing" LOST IN NEW JERSEY DYFS,DCPP CPS system,but yet"lied under oath"and or in sworn-in affidavits,on how the child do not need to go home,to mom since the child was" doing well...so no need to return child to mom. (child was in hospital(s)dozens ALL known to the aforesaid defendants. 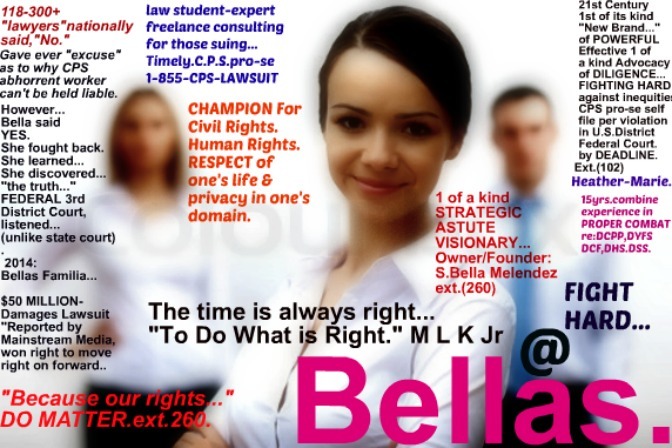 Shocking the Conscience,plaintiff- founder/boss bella,clearly able to establish,"the intent"is there,and we will be naturally keeping all our many followers/lawyers/experts all posted,and thank you for your well-wishes weekly at our student ctr. The NATION FIRST OF ITS KIND CTR. Such federal court,has done what "state"bias court failed horribly to do. but in the U.S.DISTRICT FEDERAL COURT. to New York City,across nation.Bellas vision is not in any way unclear. in which her incredible superb-knowledge,uniquely-astute in such field lacking such,has made her realize"
able to procure around the clock day in, day out support,for which is warranted when your suing C.P.S. "If your sitting online" day in day out doing the same thing,without accomplishment to rid CPS out of your child/your own life/and or to HOLD CPS ACCOUNTABLE per injury and such multitude of violations involving caseworker/supervisor then your going to continue to violated. A daily true inspiration for all who are suing timely C.P.S. "Help Form found on this page or click here"